It was interesting to watch the entourage. The former president needed a bit of help and Barbara waited as they made their way to the stools that had been placed there. 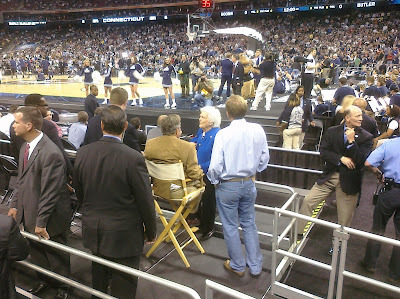 Soon two of their teenage grandsons joined them court-side. Each had what looked like a five gallon bucket of popcorn. We were on the same side of the court as the Butler band and cheerleaders. Sometime after the Bush family had settled into their seats, a couple members of the Butler band came over and asked if they could have a photo with the former first couple. George and Barbara graciously agreed and were all smiles. Soon, more members of the band came over in groups of three or four. They came with their instruments and offered them to George and Barbara as props for the photos. The Bushes seemed to be enjoying the the photo session. They were hugging band members and joking with them in addition to the photos. Then came the Butler cheerleaders for their photos. They got the same warm welcomes and big smiles from the Bushes. 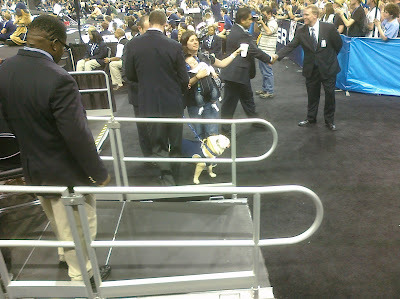 Next was Butler Blue, the Butler live bulldog mascot. He sat on George's lap and after Barbara posed for a couple photos with Blue, she climbed off her stool and got her camera out. She took a photo of the former president and Blue. I had to wonder with all the photos they must have with dignitaries, exactly where will the photo with the bulldog go? The students were very polite and respectful. As the time before the tip wound down, so did the photo requests from Butler students. There were military personnel near the court. They were going to hold the court sized flag for the national anthem. One young military man came over to George to introduce himself and he offered a salute to the former commander-in-chief. President Bush offered a half-hearted salute before grabbing the young man in a bear hug. It was very emotional to watch the respect on both sides. Several other young soldiers came over as well. Our pregame show alone made the seats worth the money. Butler out-uglied UConn in the first half and retired to the locker with a 22-19 lead. Each year the Naismith Memorial Basketball Hall of Fame announces its inductees for that year at halftime of the championship game. Dennis Rodman headlined 2011 class announced during that evening's halftime festivities. Chris Mullin, Tara VanDerveer, Tex Winter, Herb Magee, Artis Gilmore, Teresa Edwards, Reece "Goose" Tatum and Tom "Satch" Sanders were also inducted. They all made their way out to center court to be introduced to the crowd and receive their just applause. 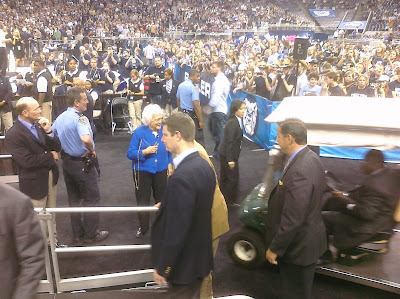 They were led off the court and to George and Barbara's seats to introduce themselves and receive congratulations from the former first couple.Each processed through the line with a handshake and a few short words from Barbara and then George. The line move rather quickly. That is until Dennis Rodman got close to Barbara. What could he and Barbara have in common? Under what circumstances would they have ever met? I don't know the answer to either question but when Rodman got within ear shot of Barbara, she reached out and gave him a huge embrace. She pinched his cheek while he was smiling ear to ear. It was plainly obvious that there was friendly chemistry there. As the rest of the inductees made it through the line and went to their seats, Rodman and Barabara and George carried on an animated conversation, waving their hands and yucking it up. Rodman left as the time wound down - showing respect for the Bushes and their grandsons. It was so interesting to watch the encounter. As I crafted the blog post, I had to review who played Butler that night. I remembered that Butler played because of Blue's photo with George. I had forgotten that UConn won the National Championship that night in a rather ugly game. 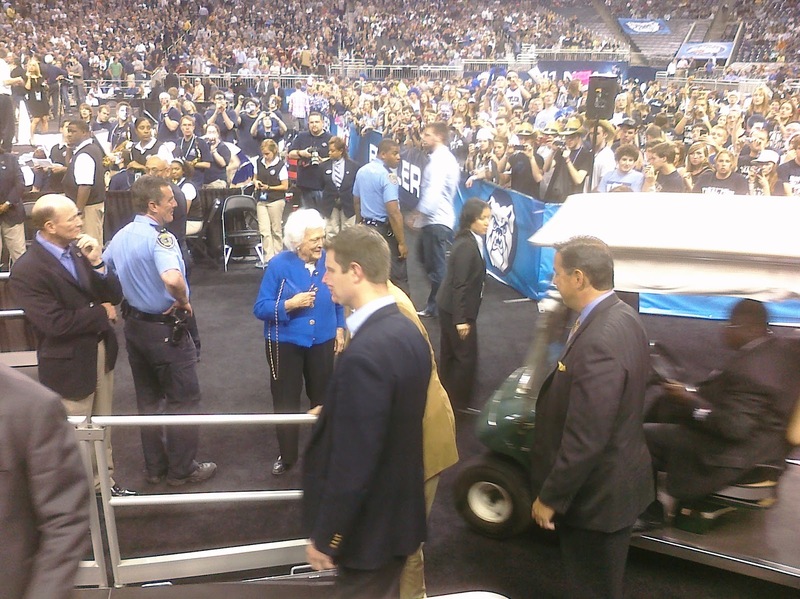 But I will always remember how George and Barbara Bush treated everyone with whom they came in contact that night. While George is being remembered for his service to our country, the kindness, friendliness and respect they showed to everyone (including Blue!) may be their greatest legacy. What a wonderful blog aand memory! Good job Doug.